Thousands of people ran in the New York City Marathon Sunday as more than two million watched from the sidelines. Shalane Flanagan became the first American woman to win the New York City Marathon since 1977. Rana Novini reports. An NYPD officer proposed to his partner at the New York City Marathon on Sunday. The NYPD posted a photo of the proposal on Twitter. The department said the NYPD officer proposed to his partner, who is an auxiliary officer. And in case anyone was wondering — "She said yes!" the department tweeted. "Auxiliary Officer Nemyzov was happy to finish the #TCSNYCmarathon, but Officer Ramos had something else planned. Congrats!" the tweet read. Thousands took part in the marathon on a rainy Sunday as more than two million watched from the sidelines. 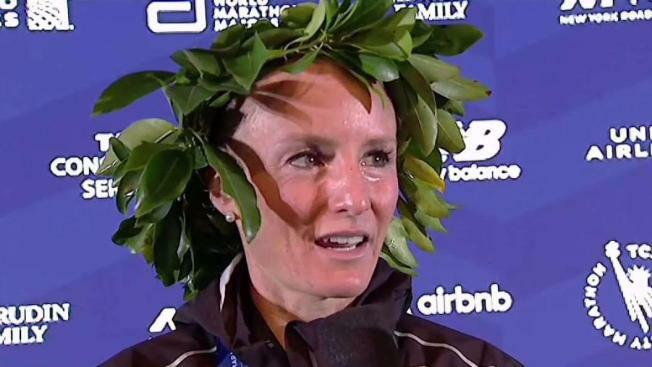 Olympian Shalane Flanagan became the first American woman to win the marathon since 1977.